Amazon's retail business is primed for continued growth. The company is the lead market participant and dominator of the e-commerce market. Physical store and omnichannel expansion will bolster long-term commerce growth. AWS remains the backbone of the Internet. AWS' critical role and first mover advantage cannot be understated. As growth begins to decelerate longer term, management should become increasingly focused on expanding e-commerce margins. Margin expansion will boost profitability and free cash flow longer term. In general, Amazon is a force to be reckoned with. As optimistic as this may sound, Amazon has nearly unlimited TAM potential. The company continues to aggressively disrupt other industries. This aggressive management style is a key reason I rate the stock at buy. Rating reiterated at buy. Price target increased from $1,750 to $1,920 due to lower cost of capital assumptions. I'm reiterating my positive outlook on Amazon (NASDAQ:AMZN) stock, and raising my price target from $1,750 to $1,950 despite my belief that headwinds may increase longer term. What are these headwinds? These are the five main business headwinds I believe Amazon has working against it. Regulation: Some bears are concerned about potential for increased regulation on big tech, with Amazon being one of those big tech names. In the past, politicians and the media have harshly criticized Amazon for numerous reasons. This includes labor practices, USPS relationship, taxes (or lack thereof), and their general size. While some concern is legitimate surrounding regulation, I believe that Amazon, like other tech companies, will have more of a self-imposed form of regulation. We already seen examples of Amazon creating self-imposed regulation. When Vermont senator Bernie Sanders complained about the low wages Amazon provides its workers, Amazon didn't wait for government to impose regulations on them. Rather, Amazon increased wages across the board to a $15 minimum. In the last month or so, I have seen media coverage and political criticism significantly die off. Even assuming Amazon does become a subject of intense criticism again, self-imposed regulation will most likely substitute government regulation. There's one area where I do believe self-imposed regulation will not be satisfactory. This has to do with antitrust regulation. The argument is, Amazon is an 800lb gorilla that has to much influence on the consumer and on other competing marketplaces to create a healthy business environment. The problem with this belief is that there's no material evidence that Amazon's size is negatively impacting consumers or other competing enterprises. On the business side, we haven't seen Amazon enforce any kind of anti-competitive measures. At this point, there's no material evidence (other than Amazon's sheer size) that Amazon is using its dominance to poorly treat its customers or other competitors. Overall, I do not believe harsh regulatory scrutiny is coming for Amazon. Even if we do get some level of regulatory scrutiny for big tech companies like Amazon, it shouldn't make a dent in the operations of the business. Capital Intense Business: The second, more frightening problem with Amazon is the capital-intense nature of the business. For years, Amazon has been able to get away with continuously ramping capital expenditures and operating expenses at the expense of profitability. However, if revenue growth begins to slow (which I believe it will), investor focus will turn toward cost management and cost growth. The question with Amazon's cost trajectory has to do with how cost controls will impact investor sentiment, rather than fundamentals. As many investors know, Amazon has long baffled skeptics with astronomical share price appreciation, despite intense cost growth. The reason Amazon has been able get away with this cost growth is because of their perceived innovation and revenue growth potential. Let's not forget, Amazon started off in the late 1990s selling books online. Now, the company, because of its massive investments, has moved into a variety of product categories, cloud computing, entertainment services, venture capital investing (more on that later), and logistics. Amazon's management team has had an extremely good vision for where they wanted the company to be, not in the next handful of quarters, but in the next many years. Management's long-term vision has allowed the company to expand costs voraciously without sentiment regarding the company's growth status waning. Basically, Wall Street was OK with Amazon "getting big fast," despite sacrificing short-term profitability. Now however, despite the many major long-term tailwinds Amazon's business has, revenue growth is beginning to decelerate. I believe revenue growth decelerating is OK. However, this means Wall Street will look increasingly at profit growth rather than revenue growth. This requires solid margin expansion, new territory for a company like Amazon. While Amazon bulls have hailed the company's ever improving AWS margins, AWS will not drive profits longer term. Instead, Amazon needs its core retail operation to get profitable. That may be difficult, however, as the company needs continuous investment in order to maintain a competitive edge. Overall, the story with Amazon is shifting away from a revenue growth acceleration story to a profit growth story. In order to achieve elevated levels of operating income expansion, Amazon will have to reduce cost growth to expand margins. I do not believe this bad for investors, as it's just the Amazon story evolving. Increased Cloud Competition: AWS has long been Amazon's profitability driver. Now, however, competition is beginning to enter the market from other hyperscalers. While I believe Amazon is well positioned long term in the cloud, the company faces increasing competitive headwinds. Competition from both the Google Cloud Platform (NASDAQ:GOOG) (NASDAQ:GOOGL) and Microsoft's (NASDAQ:MSFT) Azure cloud platform will most likely take market share from Amazon in the short term. The question is, does it come at the expense of margins or growth? I believe AWS has a few competitive advantages. Their first advantage is their first mover presence in the market. AWS was the first platform to make cloud computing go mainstream. I would go as far as to say that AWS itself created the modern day cloud computing business model. As such, they have the most experience in the cloud computing market. More experience builds up more efficiencies. Outside of AWS' first-mover advantage, the platform has multiple other advantages over the competition. The next one has to do with name recognition and marketing. AWS has spent much more money on omnichannel marketing (TV, video, internet, etc.) than Microsoft Azure and Google Cloud Platform. AWS has been marketed much more than competing platforms. This could help with name recognition. AWS was even mentioned in certain NFL games as the lead data analytics platform. As the small business moves increasingly to the cloud, marketing will be more important to market share than even before. Thirdly, and most importantly, AWS continuous ability to reduce prices without seeing a reduction in margins is its last key competitive advantage. As Andy Jassy (AWS president) put it, it's really easy to cut prices. The platform is finding new technical efficiencies practically every day, allowing the company to lower prices to consumers. While Google Cloud and Azure continue to grow, they may use internal efficiencies to expand their own margins, whereas AWS continues to pass internal savings on to its own customers. While this creates flat margin growth, it boosts customer retention and customer acquisition. Over the last decade, AWS has lowered prices more than 70 times. In addition, much of the new, 2019 IPO market is built on AWS. Companies like Uber (UBER), Lyft (NASDAQ:LYFT) and Twilio (NYSE:TWLO) cannot exist without the modern day cloud, and AWS within it. AWS and cloud computing in general should remain strong in the years to come. Competition should not eat into AWS' business. International Headwinds: The last major headwind Amazon is facing comes from its international business segment. One part of the Amazon growth narrative thus far has been the company's ability to bring its disruption to international markets, particularly with e-commerce platforms. The problem with Amazon's international business segment is its profitability, or lack thereof. In Q4, Amazon's international business segment reported revenues of $20.8 billion, up ~19% Y/Y FX adjusted. The problem is, the segment reported losses of $642 million in the most recent quarter, an operating margin of -3%. Unlike in the US, where Amazon has established competitive advantages, Amazon is far less established in international markets and has far more potential competition. Thus, Amazon has resorted to investments in local competitors like Flipkart. Coupled with varying international regulation creating an increased barrier to entry, and Amazon's success internationally looks unsure. In addition, other US competitors like Walmart (NYSE:WMT) are trying to compete abroad. Amazon will most likely be in heavy investment mode internationally to establish a position of market dominance. That being said, there remain many unknowns in the international markets. Thus, I believe of the four headwinds I have highlighted, Amazon's international expansion and profitability is the most severe. The company is the single greatest disruption machine on the face of planet Earth. That may sound exaggerated, but it's my investment philosophy with Amazon. Let's not forget that Amazon started out in 1997 selling books on a web portal. Since then, the company has become a global e-commerce empire, becomes an essential part of all Internet traffic, and become a leader in the AI market. In addition, Amazon has made a handful acquisitions including PillPack, Ring, and Twitch to expand its reach. Basically, Amazon continuously goes after large markets with potential for significant disruption, and, well, disrupts them. Amazon's ability to get cheap access to capital, and their strategy of reinvesting profits into expanding their market reach, has allowed the company to become a dominator of many industries. It's the strategy of continuous expansion rather than profitability that has allowed Amazon to become the second largest company on Earth (by market valuation). One of the reasons many are reluctant to be optimistic on Amazon's stock is the idea that the valuation isn't compelling. In my view, Amazon's valuation is quite compelling. Wall Street just needs to give the story time. Right now, Wall Street seems quite content to just let things play out. Let's look at Amazon relative to peers. Applying this median PEG multiple to Amazon shares and we get a P/E ratio of 71.655X. On a 2019 EPS figure of $27.53, we get a share price of $1,972.66, ~7% above the current price. Let's now look at Amazon's valuation relative to sales. 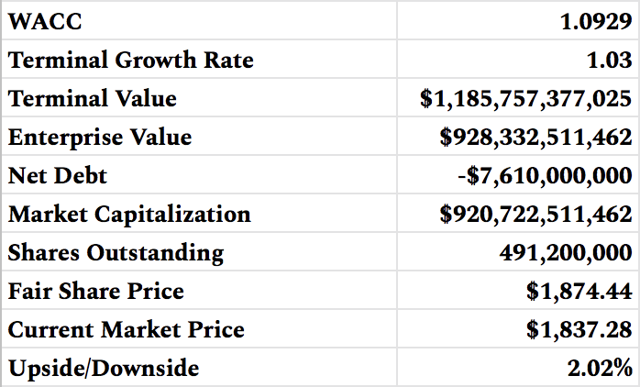 Applying this PSG median multiple to Amazon shares and we get a P/S ratio of 6.282X. On $275.13 billion in 2019 revenue, this implies a share price of $3,518.66, ~91% above the current price. However, as I outlined, investor focus should turn to profit growth rather than revenue growth. This makes my valuation based on Amazon's profits far more reasonable than my valuation based on sales. Nonetheless, Amazon is valued at an egregious discount to its peers when looking at its sales multiple and growth rate. 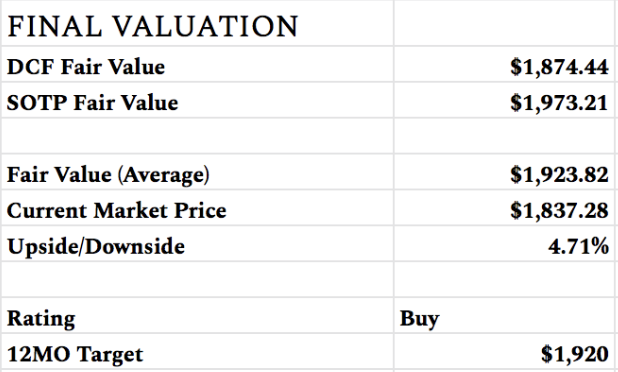 However, I do not base my price targets purely on relative valuation. Rather, I base it on a combination of a sum-of-the parts and discounted cash flow valuation. 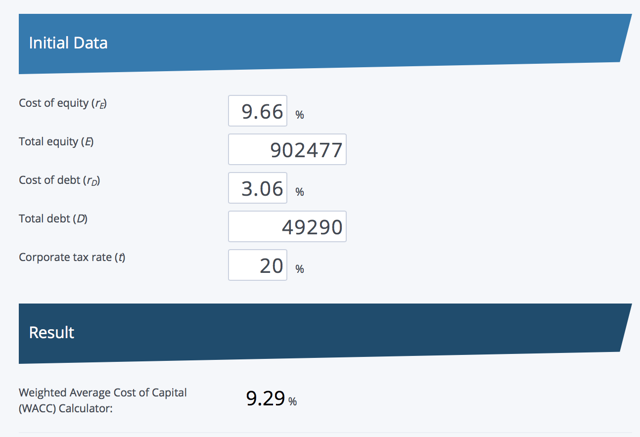 This cost of equity assumption uses an unlevered one-year beta of 1.41 (source), a 2.499% 10-year Treasury yield, and an equity risk premium 506 basis points (per Damodaran). Now, I'll move on to my assumptions for the business. This assumes an FCF CAGR of ~26.9% as capital spending decelerates while margins expand. 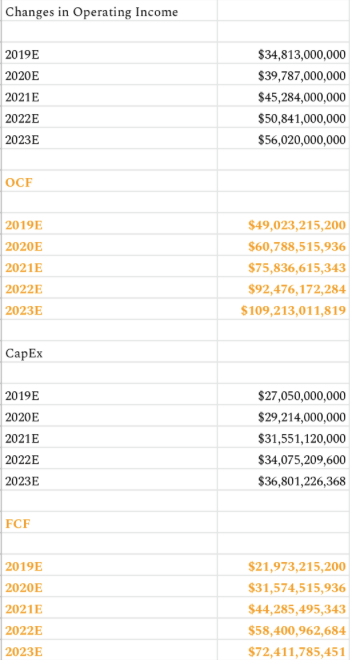 Lets look at the final DCF valuation. Now on to my sum of the parts model. For many of these business segments, I use growth multiples in the 20s and the 30s for this business segment. In addition, this assumes that AWS grows to a larger side than retail as a whole. Overall, this yields a twelve month price target of $1,920, ~5% above the current price. Amazon stock, even at current levels, remains a compelling offering. While some headwinds do exist in the short term, they will most likely have a negligible effect on Amazon's business longer term. Margin expansion, continued revenue growth, the eventual profitability of the international segment, and general market dominating nature all make me optimistic on the stock. Reiterating buy, raising PT from $1,750 to $1,920. Disclosure: I am/we are long AMZN, GOOG. I wrote this article myself, and it expresses my own opinions. I am not receiving compensation for it (other than from Seeking Alpha). I have no business relationship with any company whose stock is mentioned in this article. Additional disclosure: This is not financial advice. I am not recommending an investment in any of the securities mentioned. Please do your own due diligence before initiating positions in any of the securities mentioned.